Nya Ullevi is the largest football stadium in Sweden. Though it is currently not occupied by any club team, it is occasionally used for local derbies and other important matches. Nya Ullevi was built to serve as one of the playing venues of the 1958 World Cup. Construction started in 1957 and was completed in the spring of 1958. The stadium could initially hold 54,000 spectators (32,000 standing). The stadium officially opened on 29 May 1958 with a match between the Swedish national team and a selection of players from the Gothenburg area. Four group matches were played at the stadium during the 1958 World Cup, along with a quarter-final, the semi-final between Sweden and West Germany (3-1), and the match for third place. One year later, in 1959, Örgryte IS, IFK Göteborg, and GAIS moved into the stadium. Their stay lasted until 1992 when they moved to the smaller Gamla Ullevi which better fitted their attendances. The record attendance of the stadium was set in 1959 when 52,194 people visited the local derby between IFK Göteborg and Örgryte IS. 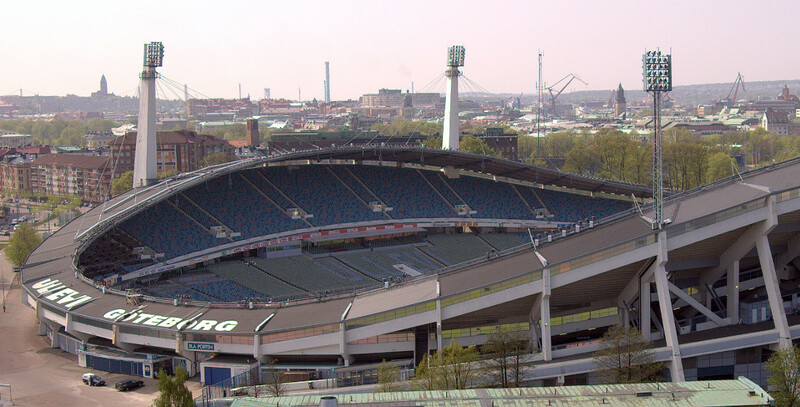 Nya Ullevi was one of the four playing venues during the 1992 European Championships that were played in Sweden. Apart from hosting three group matches, the stadium also hosted the semi-final between Denmark and the Netherlands (2-2), and the final between Denmark and Germany (2-0). Nya Ullevi furthermore hosted two Cup Winners’ Cup finals, the first in 1983 between Aberdeen and Real Madrid (2-1), and the second in 1990 between Sampdoria and Anderlecht (2-0). In 2004 it hosted the UEFA Cup final between Valencia and Marseille (2-0). Nya Ullevis is located less than a kilometre east from Gothenburg’s main rail station and city centre. The walk will take no more than 10 to 15 minutes. The stadium is part of a complex consisting of several other sports and event facilities, among which the Gamla Ullevi stadium, the current home of the three Gothenburg clubs. The E6 motorway runs just east of the stadium. Leave the motorway at exit 73 Centrum. There are furthermore several tram routes passing the stadium (e.g. line 1, 2, 3, 6, and 8). Stop Ullevi Norra and Ullevi Södra lie next to the stadium. Nya Ullevi lies in a rather quiet area that is a mix of offices, residential buildings, and other sports facilities. Gothenburg’s city centre is a short walk away though, so there is no reason to head to the stadium too much in advance. Gothenburg’s proper nightlife areas are just south of the historic centre along the Avenyn, Vasagatan, and Linnegatan streets. Avenyn, the principal nightlife street, is a mere 10-minute walk away from the stadium. The central location of Nya Ullevi makes that there are many hotels around. You can either choose one north-west of the stadium toward the main rail station, or one toward the south near the nightlife areas. The options toward the north include Hotel Arena, Clarion Collection Hotel Odin, Hotel Royal, and the somewhat cheaper Hotel Palace. These all get good reviews. Toward the south, Hotell Liseberg Heden, Hotel Allén, and Hotel Poseidon are some of the various well-rated options. For all hotels near Nya Ullevi click here. Tickets for events at the Nya Ullevi can be bought online via Ticnet, by phone +46 31 81 10 20, or at the box office of the Scandinavium indoor arena (located just south of Nya Ullevi). Goteborg.com – Gothenburg tourist information. Ullevi.se – Official Nya Ullevi event management website. Vasttrafik.se – Gothenburg public transport information.